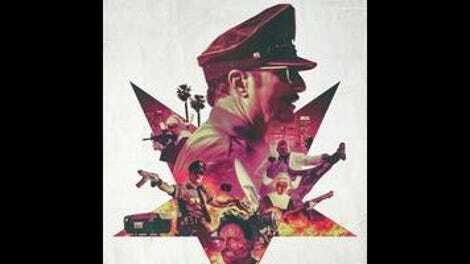 Anyone who’s yearned for a version of RoboCop devoid of satire, but suffused with the sensibility of Slipknot, will thrill to Officer Downe, an ultraviolent comic-book adaptation directed with spastic overkill by the heavy metal band’s resident percussionist/“scary clown.” There’s a bit of Sons Of Anarchy in there, too, as Kim “Tig” Coates plays the film’s title character, who isn’t technically a robot but might just as well be. Early on, we see the maniacally justice-obsessed Officer Downe blown to kingdom come while pursuing a suspect, then observe as a secret underground unit of the LAPD (headed by Lauren Luna Vélez, which seems like an in-joke for Dexter fans who constantly marveled at María LaGuerta’s incompetence at Miami Metro) proceeds to bring him back to life, Frankenstein style. Why this world-changing technology is being employed solely to serially resuscitate a single maverick cop, however efficient he may be, never gets explained… but, then, Officer Downe isn’t overly concerned about viewers exercising many brain cells. Peter Weller succeeded in giving RoboCop a distinct personality despite having to act most of the movie with only his mouth and chin visible. Coates, given a lot more flexibility (Downe looks perfectly normal), never succeeds in creating a character, merely affecting a generically badass “intensity” that appears to be rooted in his mustache. He’s also burdened with the impossible task of placing some sort of faintly ironic spin on chestnuts like “If you can’t do the time, don’t do the crime,” which screenwriter Joe Casey (who also wrote the original comics) seems to think are amusing when spoken by a copy beating someone to death with a severed leg. 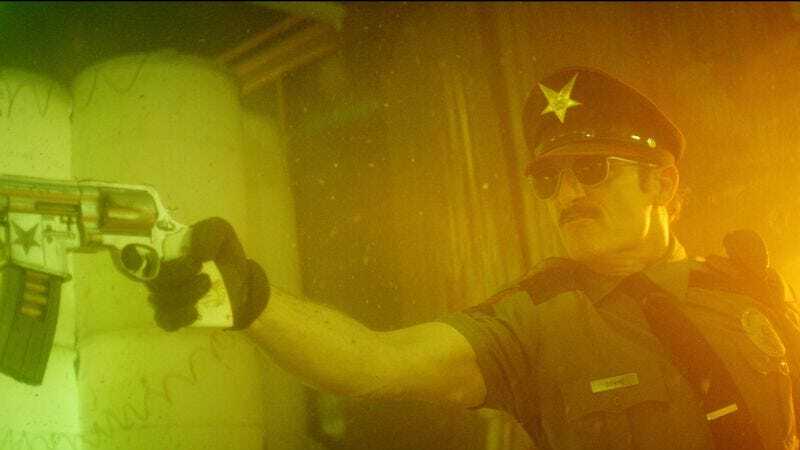 All the same, Downe is light-years more interesting than is Officer Downe’s actual protagonist, Officer Gable (Tyler Ross), an earnest young rookie who’s assigned, for no good reason, to join the crew of cops who serve as Downe’s backup. In practice, this means they sit around trading bland wisecracks outside whatever building Downe has entered, waiting for their cue to collect his corpse and take it back to the underground LAPD bunker for revival. Gable wants to prove that he’s got the stuff, however, and keeps following Downe into action, which eventually leads to him discovering his big secret. Hyperactive yet feeble, Officer Downe has no real story and no point of view—just endless, assaultive testosterone. Director M. Shawn Crahan employs the same incoherently frenetic visual style seen in Slipknot’s music videos (which he generally also directs) for the action sequences, and seems utterly at sea whenever characters are just talking. Indeed, this movie is so overpoweringly blah, despite being regularly cranked up to 11, that the appearance of Alison Lohman as an evil nun threatens to overshadow everything else about it. Lohman’s role is tiny (one scene) but doesn’t qualify as a cameo; she’s not even the scene’s focus, as the head evil nun, Mother Supreme (Meadow Williams), gets all of the dialogue. Why would an actress who was starring in movies like Drag Me To Hell just a few years ago take a spear-carrying part in a Z-grade exploitation flick? The answer appears to be that she married director Mark Neveldine (Crank, Gamer), who’s one of Officer Downe’s producers. Okay, fine, but at least give her something to do besides stand around in a habit and get her head blown apart by a shotgun. That combination of grotesque and lazy exemplifies the movie as a whole. See it if you want to think more fondly of RoboCop 2.